Shark & Safari provides shark cage diving tours from Gansbaai, 160km from Cape Town. Dyer Island is just off the coast and is home to one of the largest seal colonies in Southern Africa. The approximately 60 000 seals provide the main diet of the Great White Shark. The channel that intersects this island is called Shark Alley. Door to door transfer from Cape Town CBD and back. An information and safety briefing. Our biggest boat only take 24 clients. On the return to shore, a light lunch is served. As the Great White shark is a surface feeder, diving certification is not required as the dive is a surface float. 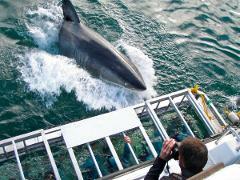 The viewing only trip is a the same price as diving - Everybody pays for the boat trip - The diving is free! Times vary every day and are dependent on the tides, weather and logistics. We will attempt to accommodate your requested time but this not always possible, especially with the transfer option.